Take your coffee or tea with a heap of tradition from another culture. At Coffeemind, sugar is added in the process of making Turkish coffee (not after), and served with water and traditional Turkish delight. For decades, Seattle has been renowned for its coffee: its cool coffeehouses, perfect beans and the smoothness of the roasts. But now, the city is moving beyond the well-known (European, Japanese and Chinese) coffee and tea traditions long found here and incorporating styles introduced by our lively and growing multicultural communities. From Ethiopian-style brewing to the best roasters from around the globe, local shops bring a world of coffee and tea to the table. Rows of metal Turkish coffee pots shine from the shelves, and imported textiles add bright patterns to a cozy corner. Part direct-import shop from Istanbul’s Grand Bazaar, part coffee shop, Coffeemind brings a curated version of Turkey to Seattle, complete with snacks, drinks and stunning decor. The dark-roasted Turkish coffee ($3.50) is unfiltered, served in the appropriate tiny mug with a nugget of Turkish delight, and goes perfectly with the Turkish feta-cheese-stuffed pastry called börek ($4.80). Queen Anne, 1907 10th Ave. W; 206.717.2147. 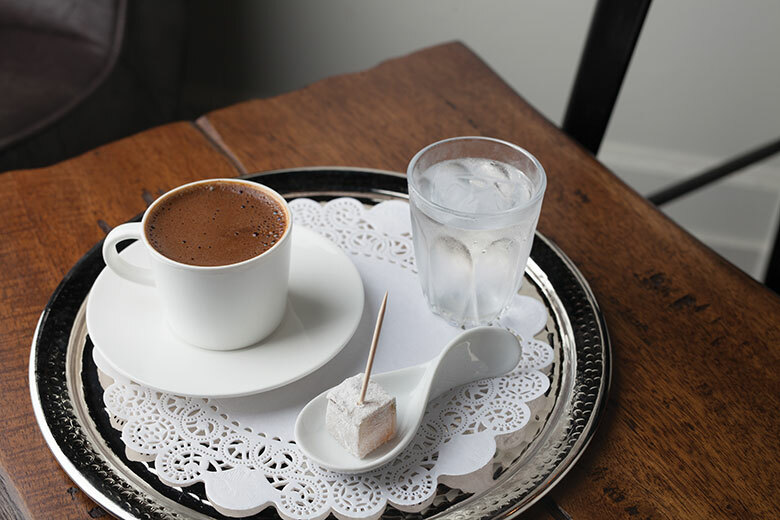 Tip: Turkish coffee tradition dictates that the sugar is added in the cooking process, rather than after, so order the number of sugar cubes you want when you order your coffee. Owner picha pinkaow re-creates the Thai street-corner stands of her Bangkok youth in this tiny, L-shaped University District shop. In her hometown, she explains, everyone customizes their Thai iced tea order by sweetness and strength as they stop on their way to work and school in the bustling metropolis. To imitate those stands, Pinkaow prepares Thai iced tea ($3) using the traditional “sock” method—pouring hot water back and forth through a mesh bag full of black tea between two pitchers, rather than infusing it. The result is a uniquely aerated, frothy, surprisingly orange drink—so colored from the added star anise, roasted tamarind seeds and cardamom. It’s made all the brighter when poured over ice, with the addition of condensed milk and a tiny bit of half-and-half before serving. University District, 1313 NE 43rd St.; 206.432.5902. Tip: Though WannYen is billed as a Thai dessert shop, its small menu features a slew of traditional takes on tea and coffee, along with a few rotating food specials each day. Photograph by Angela Ciccu; Café Avole’s traditional Ethiopian coffee service centers around a refillable jebena pot. Owner solomon dubie wants Americans to learn to drink coffee like Ethiopians do: in a leisurely way and over meandering conversation. From within the bright-green walls of this remodeled South End mini mart, he brings the Ethiopian attitude of taking life slowly—and with plenty of coffee—to Seattle. Ethiopian coffee ceremonies, often many hours long, start with the fragrant roasting of the beans, before they’re ground and brewed directly in the coffee pot. At Avole, the coffee and food menus offer American and Ethiopian options, but to soak in the community atmosphere, bring at least one friend and order a shareable, refillable pot, called a jebena, of Ethiopian-style brew ($8). Brighton, 6630 Rainier Ave. S; 206.359.1271. Tip: In keeping with Ethiopian tradition, Avole will refill your jebena three times, resulting in a progressively weaker brew as the session wears on. Photograph by Angela Ciccu; Cederberg Tea House makes its rooibos tea lattes as they are made in South Africa: pulled through an espresso machine, with a side of koeksister. Sure, even starbucks joined the rooibos tea latte train for a while, but at Cederberg, the red latte ($3.70–$4.85) is made like it is in South Africa—pulled through an espresso machine. From a small space at the bottom of an apartment building, flowers and floral patterns evoke the feeling of tea time—minus the twee—at this South African shop. Cederberg is named for the region famous for growing rooibos—which isn’t actually tea, but a dried herb from the legume family. That’s the main focus here, but the pastries and snacks offer little bites from a cuisine rather uncommon in Seattle. Queen Anne, 1417 Queen Anne Ave. N; 206.285.1352. Tip: For extra authenticity, sip it alongside a koeksister ($3.70), a braided, syrup-soaked doughnut. Photograph by Angela Ciccu; The La Marzocco Cafe shares space with the KEXP-FM radio station. A strange group of bedfellows share a Seattle Center space: a record shop, the KEXP-FM radio station and an Italian espresso machine manufacturer’s café. Yet the La Marzocco Café and Showroom has quickly become a favorite hangout of music junkies and the coffee curious. Each month, the café features a different roaster, serving only the beans and drinks of that company’s home café, giving repeat visitors a master class in the latest and greatest in the global coffee scene. Because the menu changes each month, any given day could involve Mexico City’s Buna serving horchata cold brew or the signature beans of this month’s roaster, the local Italian-style roaster Caffè Umbria.